The family tattoo could hold a highly specialized kind of meaning to each and every person who has it. 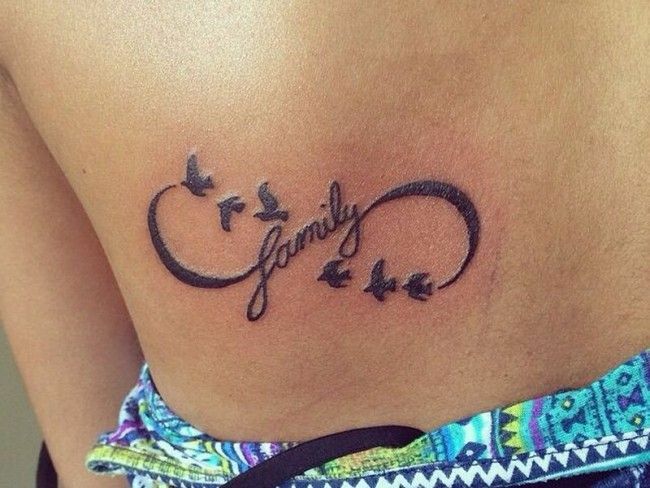 These types of tattoos are more popular with men, since it signifies the closeness that you have as a family. If you want to get a certain tattoo that incorporates your family members, there are plenty of designs and ideas out there that you could use to learn which design suits you the best. In this article, we will be sharing with you the various designs you can do for the family tattoo design. We will also be showing you our carefully curated gallery of family tattoo design inspirations that you may use. Although tattoos can mean anything that the wearer wants the meaning and symbolism behind a family tattoo is very specific. For most people, having this totem is a way to honor the people that matter most in your life or are very close to your heart. With these totems, you also have a permanent reminder and memory of your loved ones, and so you will always keep them in mind regardless of where you are. 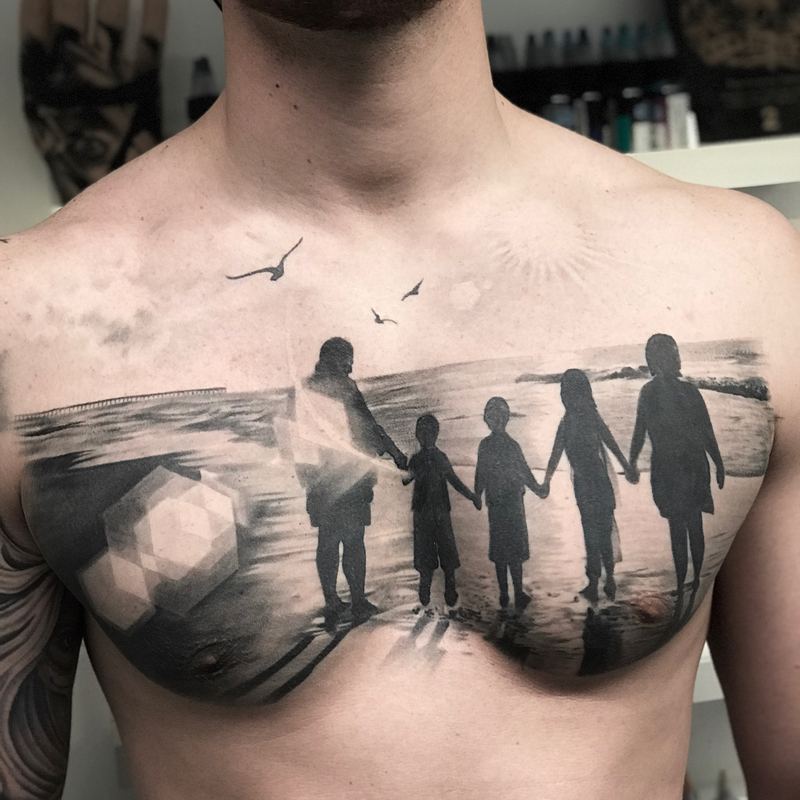 A large highly detailed chest tattoo of a family walking on the beach. A large and intricate sleeve tattoo of a tree with the word family and a quote inscribed. 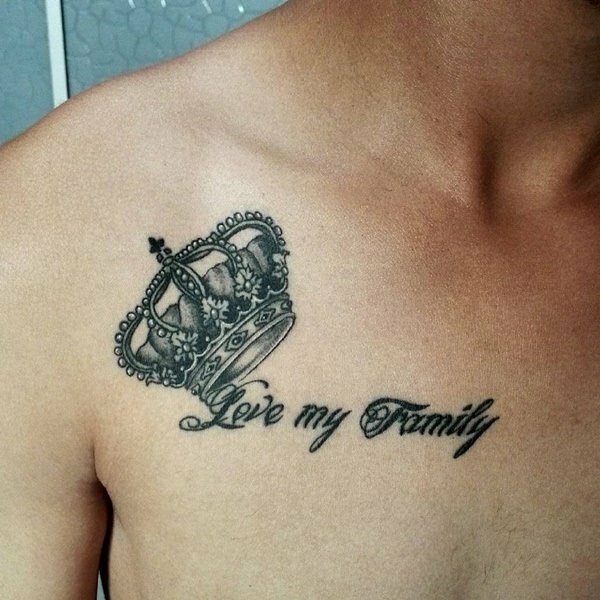 A somewhat large chest tattoo of the word family with a crown. 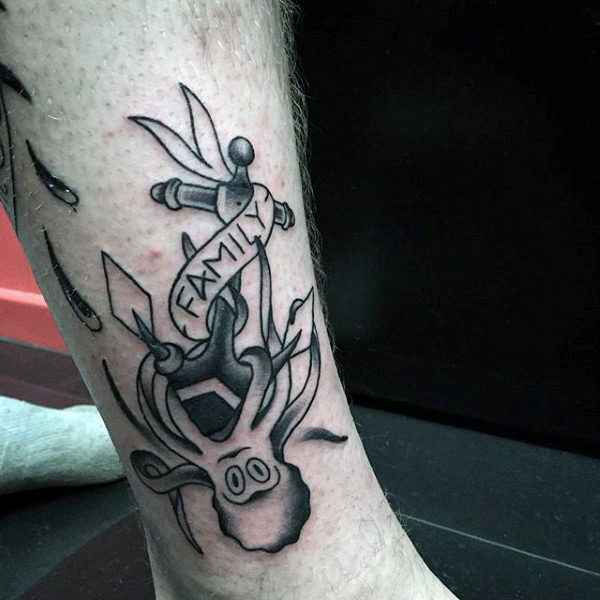 Since the family tattoo is somewhat vague in nature, each family and tattoo artists have their own interpretation of what a family tattoo looks like. Some may say that it is just a simple list of names, some say that it is an intricate work of art. A family tattoo is very personal, and so you can have anything that you feel represents your loved ones. To others, it might not look like a family body marking, but this does not matter provided you as the wearer knows what it symbolizes and like how it looks. 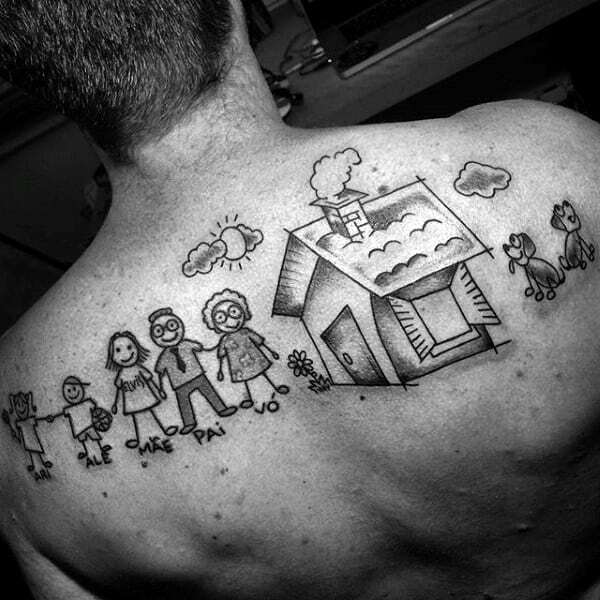 A childlike drawing of a family and a house as a back tattoo. A cursive quote tattoo of on the chest with a large crown. However, just like all other types of body art, some designs are loved more than others, and the following are some of them. This is by far, the simplest tattoo design you can imagine. All you need is just a word or a quote that describes your family and you are in town. 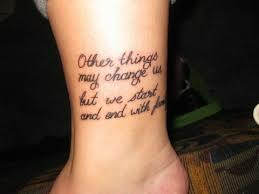 Phrases and quotes are very common tattoos, and this is because they enable one to express their feeling in a few words. A phrase is an excellent choice for your family totem because you can express what you feel about those close to you. You can have anything from a simple “I Will Love You Forever” to longer and personalized phrases. A sleeve tattoo of a tree and a somber quote indicating death. 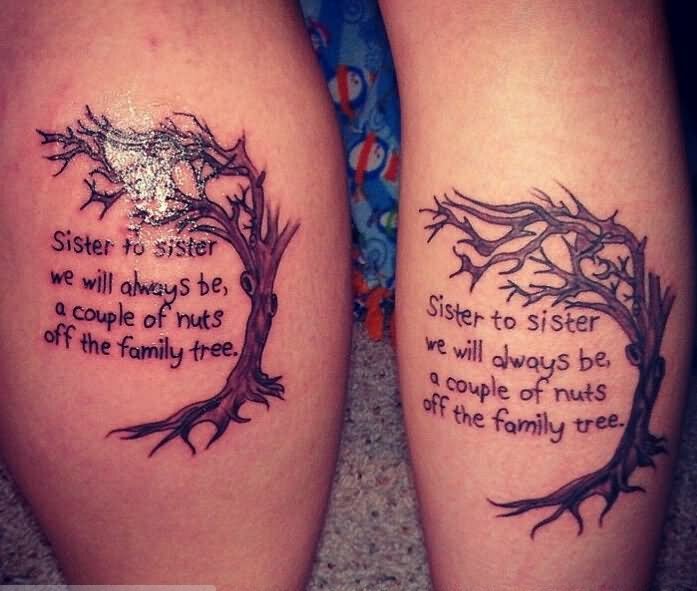 A tattoo of a leafless tree and a quote about sisterhood. 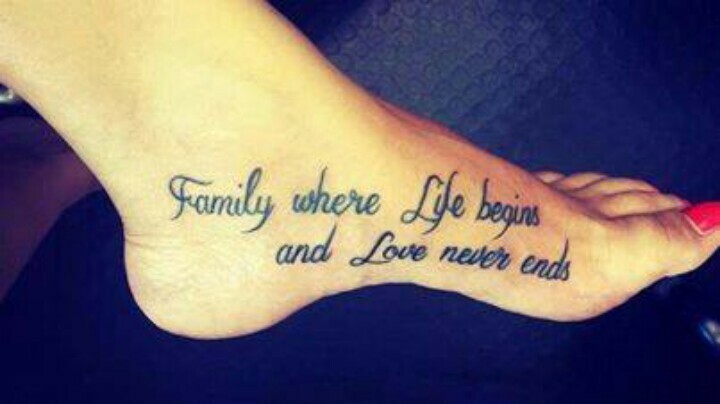 An excruciatingly painful family tattoo of a quote on the foot. 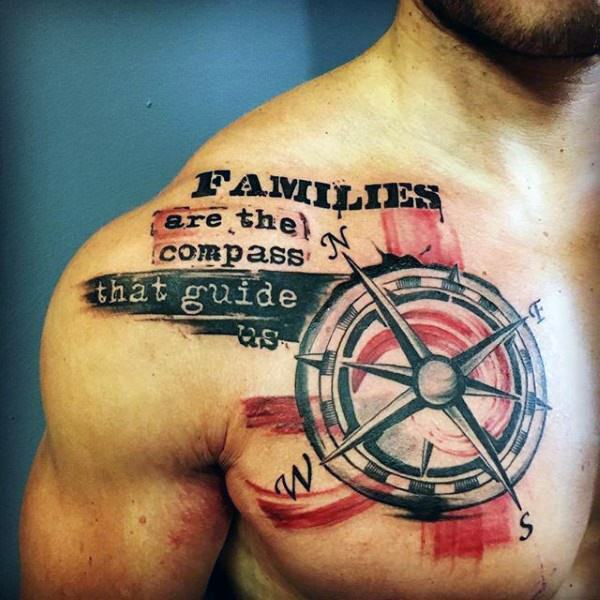 A highly detailed compass tattoo with a family quote inked on the chest. 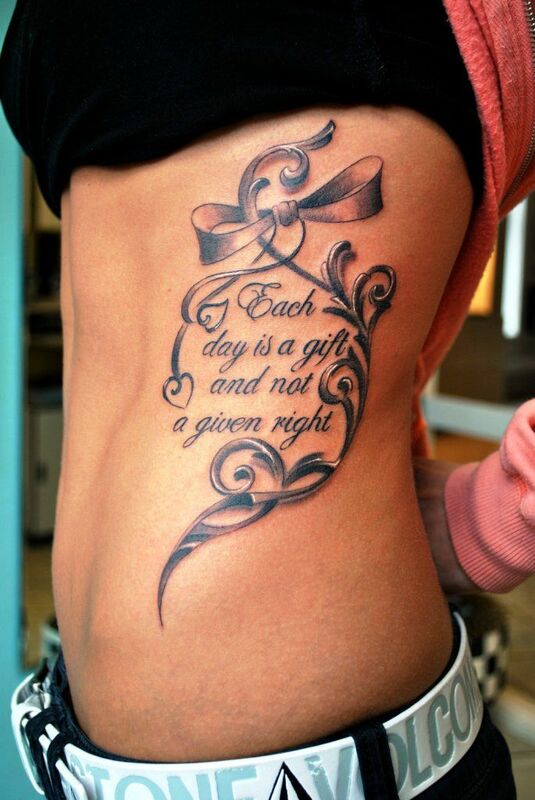 A rib tattoo of a family quote with ribbons. 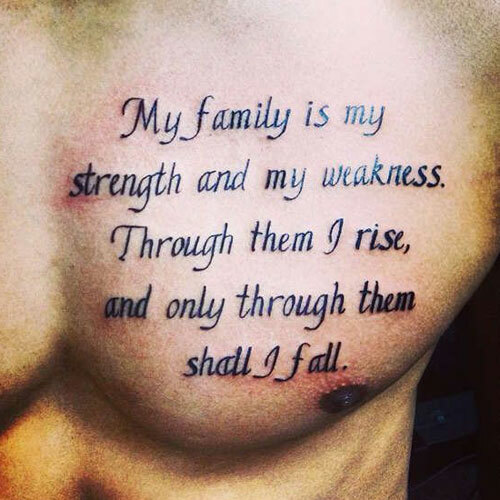 A simple chest tattoo of a long quote about family. 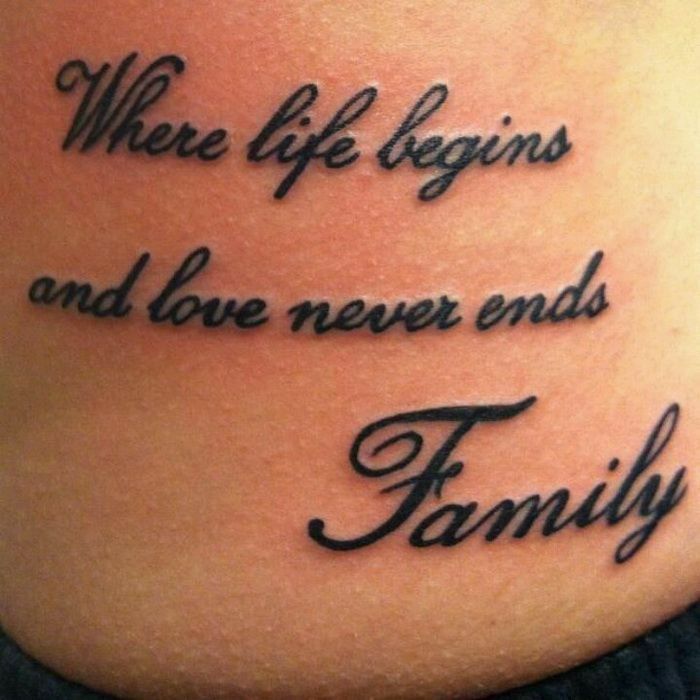 A small ankle tattoo of a family quote. 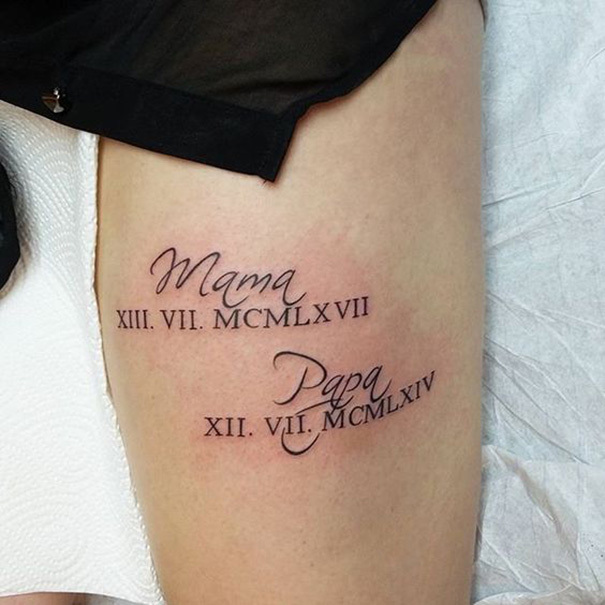 A tattoo of the words mama and papa with dates in Roman Numerals. 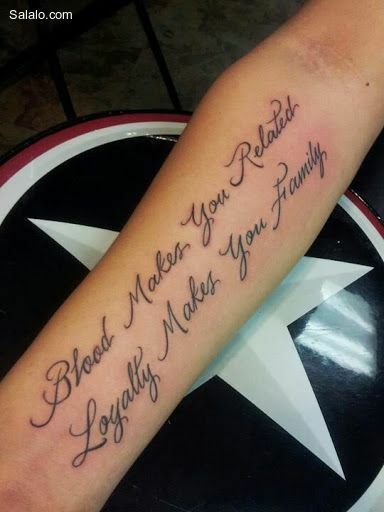 A long forearm tattoo of a quote about family loyalty. 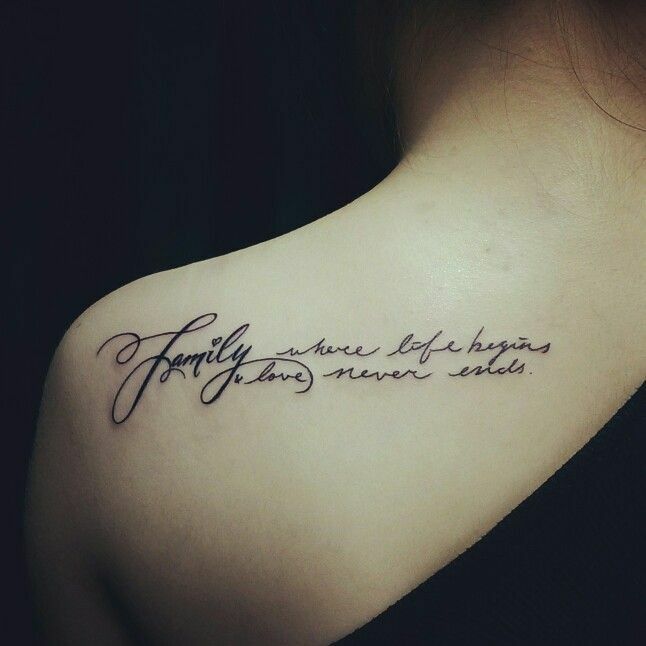 An artsy cursive shoulder tattoo of a family quote. 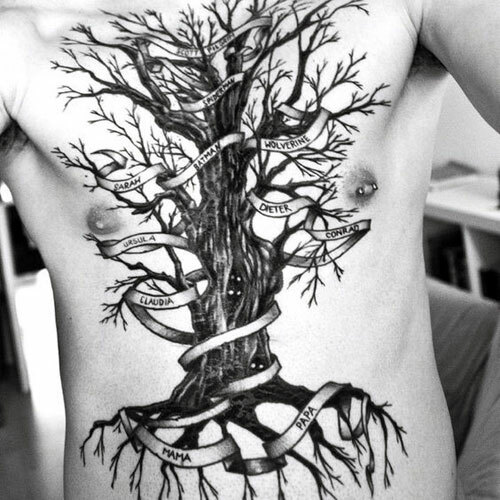 A family tree tattoo is a kind of family tattoos that are being worn by a lot of individuals all around the globe. Wearing family tree tattoos is enough for you to show how much you love and respect your whole family. For those nature-oriented families, this kind of is undeniably the perfect one to have. 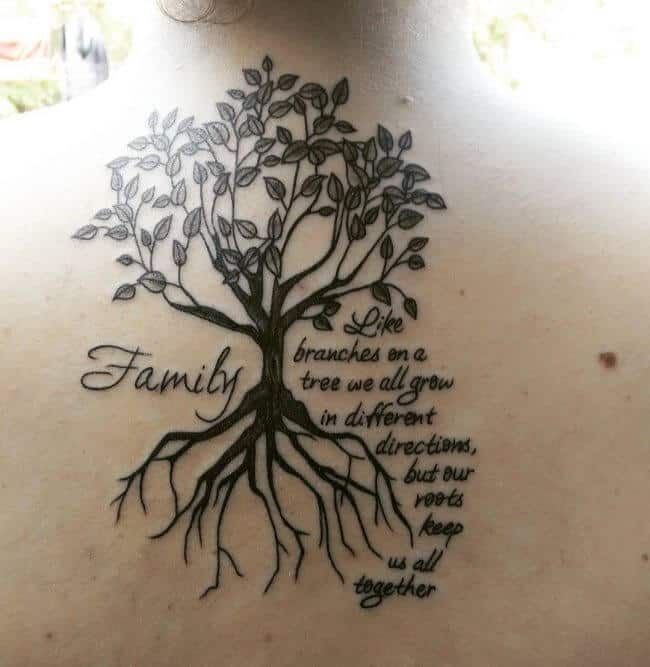 As its name suggests, family tree tattoos are diagrams of trees that display the name of every member in a certain family. These tree diagrams are designed and tattooed on people’s bodies in a way that these will look real living trees. These tattoos will even give you the opportunity to acknowledge the ancestors of your family by putting their names on the roots part of the tree tattoo. If you want to be unique when it comes to tattoos, such personal tattoo type is absolutely a great choice. An advantage of family tree tattoos is their inherent ability to become a loving memorial for those who are no longer with us. The memories of lost loved ones can be immortally preserved via this stellar form of body art. These linear arrangements are vastly customizable, but the striking content remains the same no matter what. Each name can even be enhanced with its own original calligraphy. 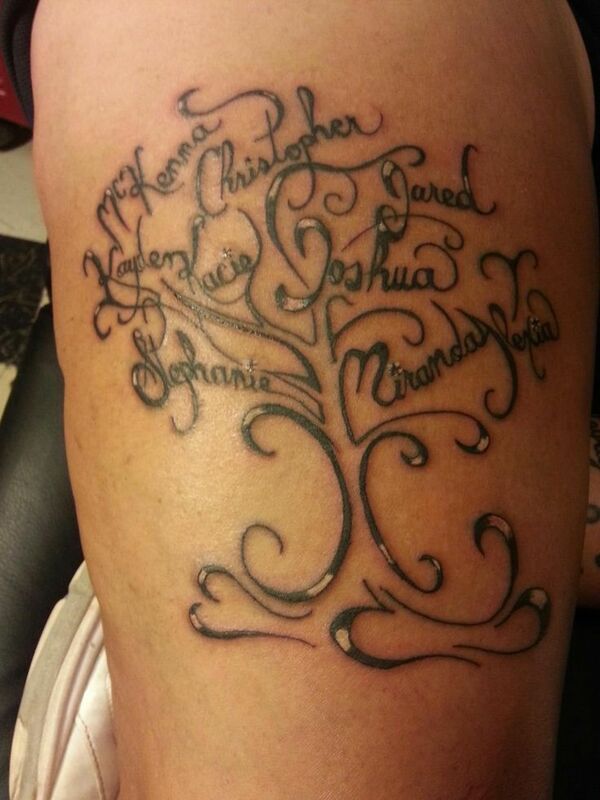 A medium size upper back tattoo of a family tree. An intricate and detailed sleeve tattoo of a family tree with all the names of the members of the family. 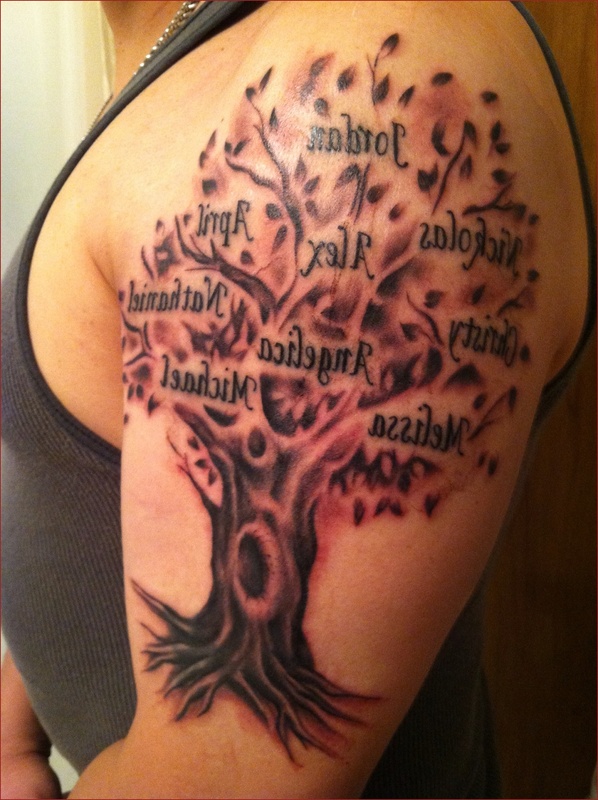 A more intricate and detailed sleeve tattoo of a family tree with all the names of the members of the family. 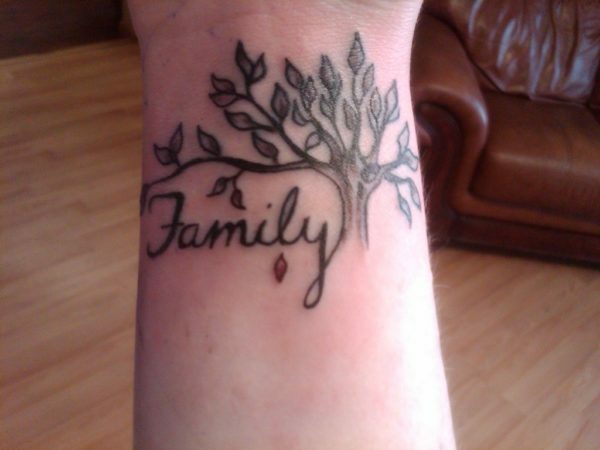 A small but highly detailed wrist tattoo of a family tree with the word family. 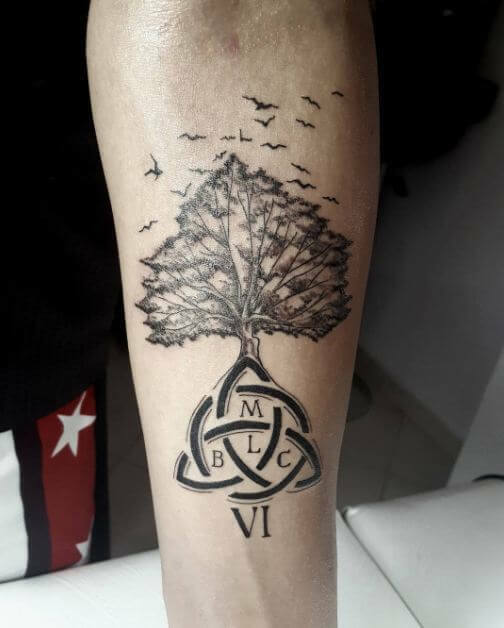 A highly detailed family tree tattoo on the forearm with the valknut symbol. 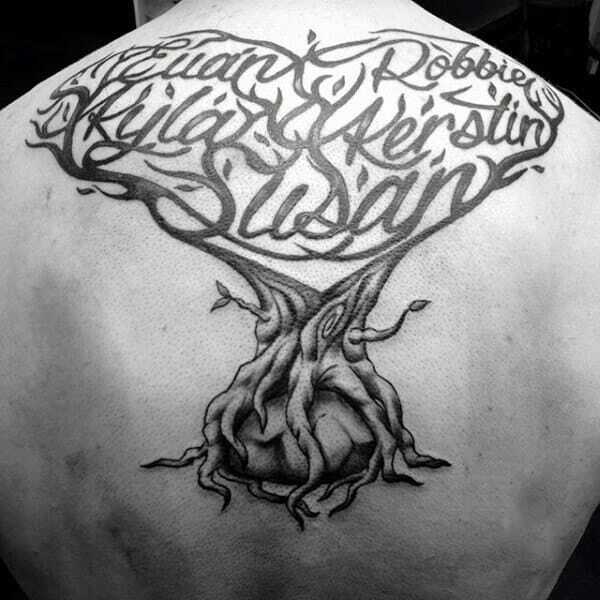 A large upper back tattoo of a family tree with the branches forming the names of the family members. A highly detailed and intricate family tree tattoo with a ribbon containing the names of all family members entangled around the tree. 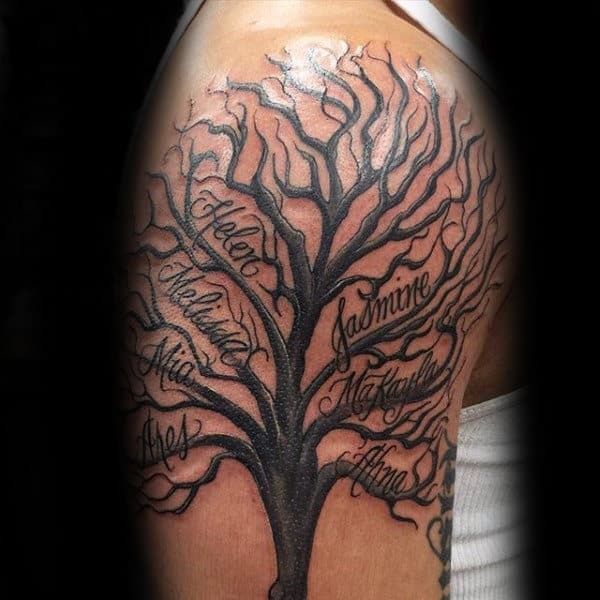 An upper sleeve tattoo of a family tree with the family members’ names. 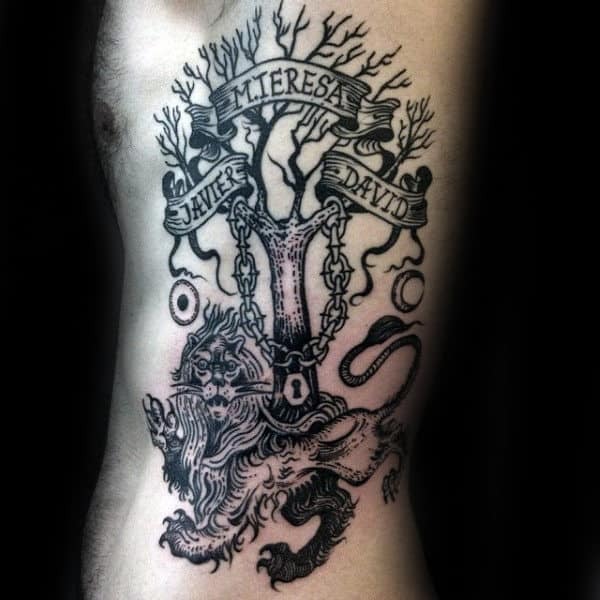 A rib cage tattoo of a family tree with chains and a lion. 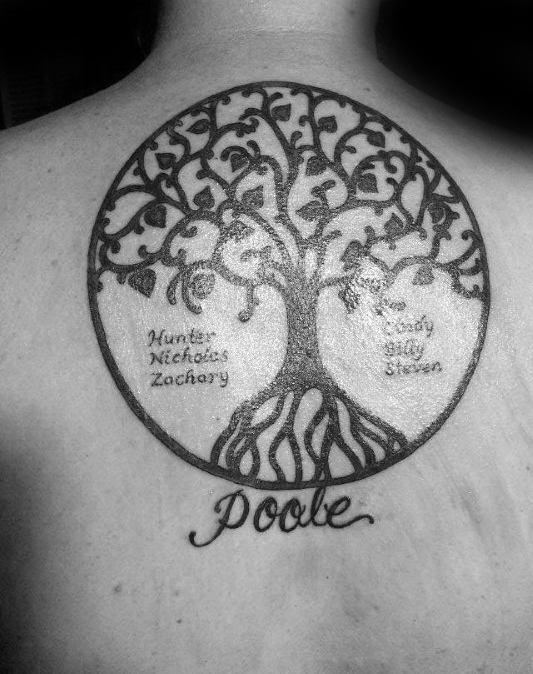 A traditional Celtic tree tattoo used as a family tree that is inked on the upper back. This is where the preferences of both men and women flip. In other tattoo designs, men are the most likely clientele group that will go for the large, detailed, intricate, and bombastic designs. They want something that is visually appealing. 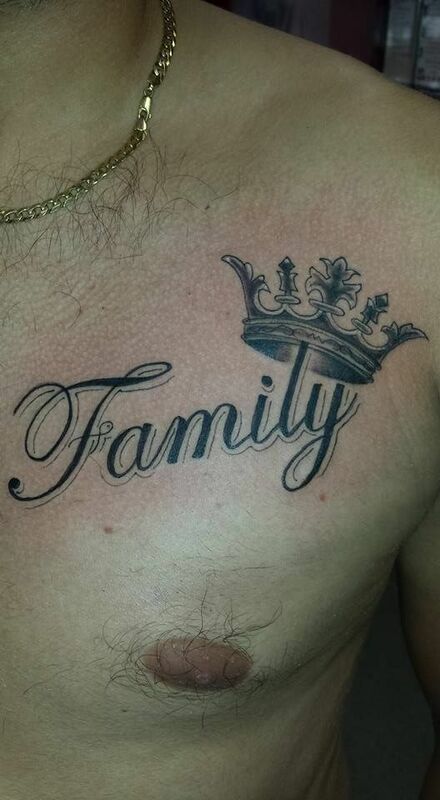 For the family tattoo, however, men tend to go for the simplest designs. Not because they are ashamed of their family but rather the opposite of it. They want it to be simple because they want their affection to overshadow the tattoo. The tattoo is just there to announce to the world that he loves his family and the decal of the tattoo is the emotion of the wearer itself. A neotraditional inspired octopus tattoo with a banner containing the word family. 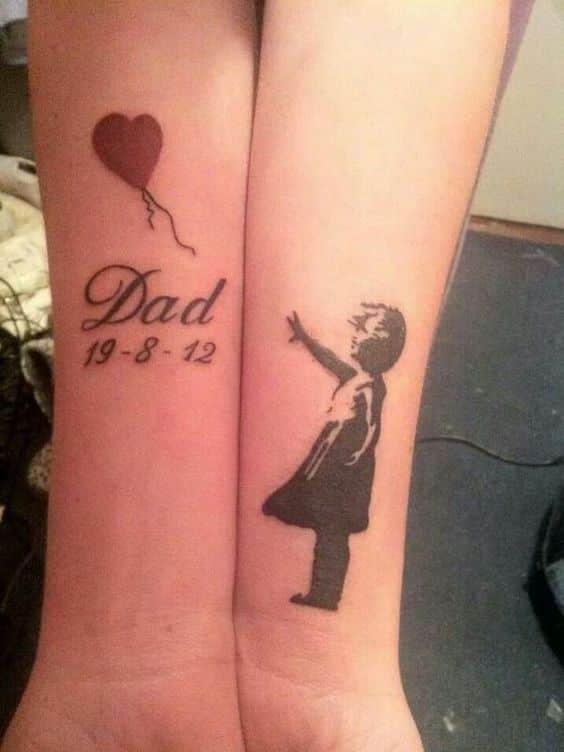 A tattoo on both forearms that indicate the word dad and a date on one arm and a child on the other. 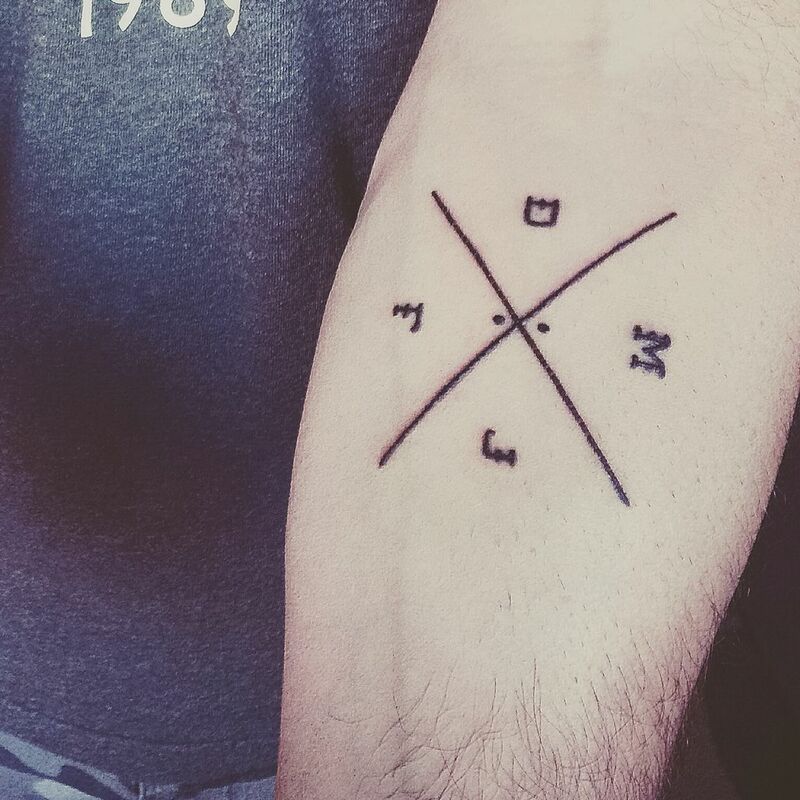 A somewhat simple chest tattoo of the world family. 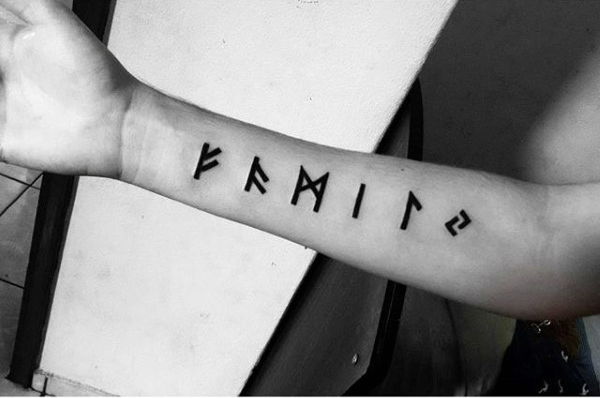 A simple forearm tattoo of four letters presumably the first letters of the family members’ names. 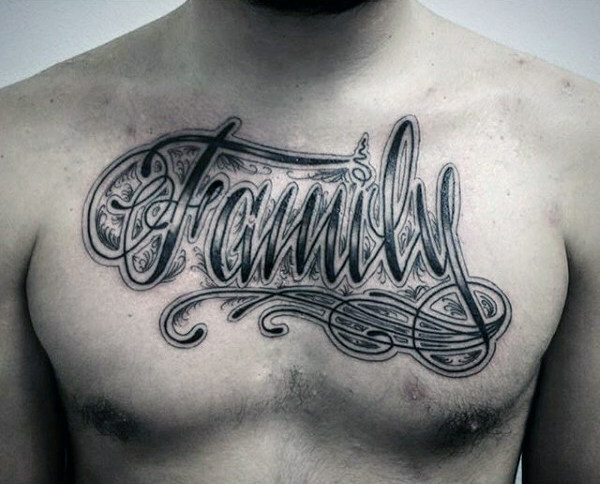 A large and intricate cursive writing chest tattoo of the word family. 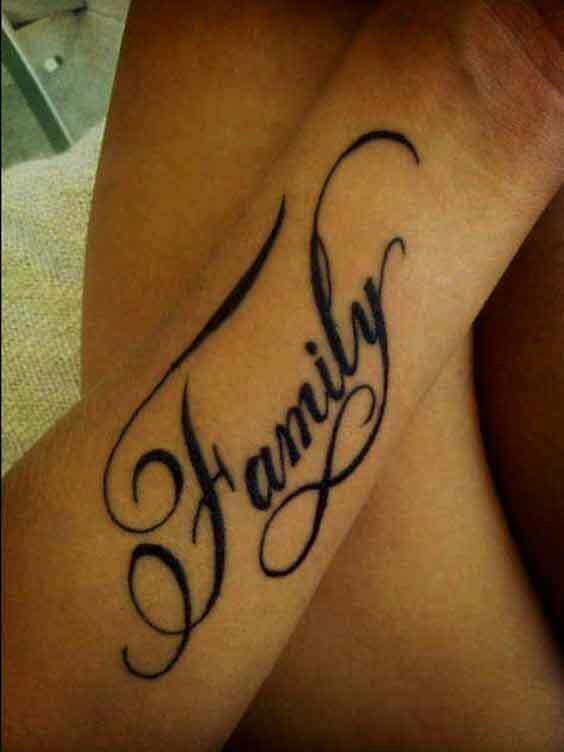 An artsy way of tattooing the word family on the forearm. 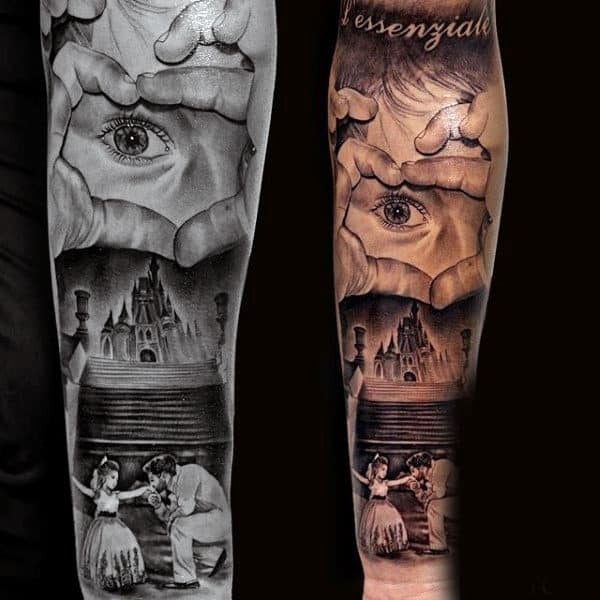 A highly detailed sleeve tattoo of the word family. 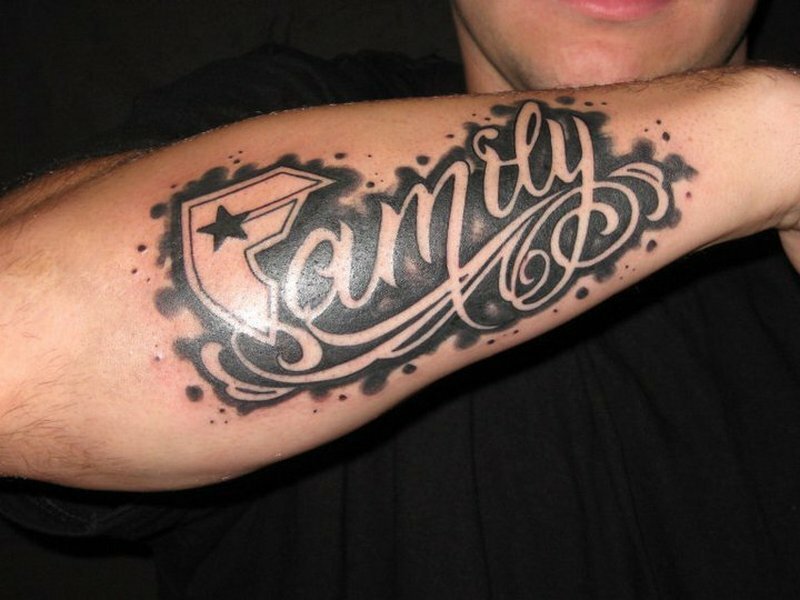 A forearm tattoo of the word family in a highly stylized font. A highly detailed and intricately designed forearm tattoo of a father and son. 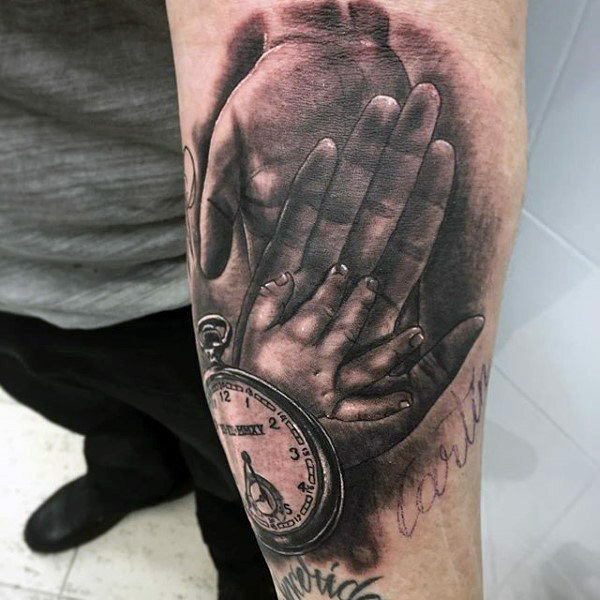 An intricate forearm tattoo of an adult’s hand and a child’s hand. Like we have mentioned above, the family tattoo is where the preferences of men and women switch places. 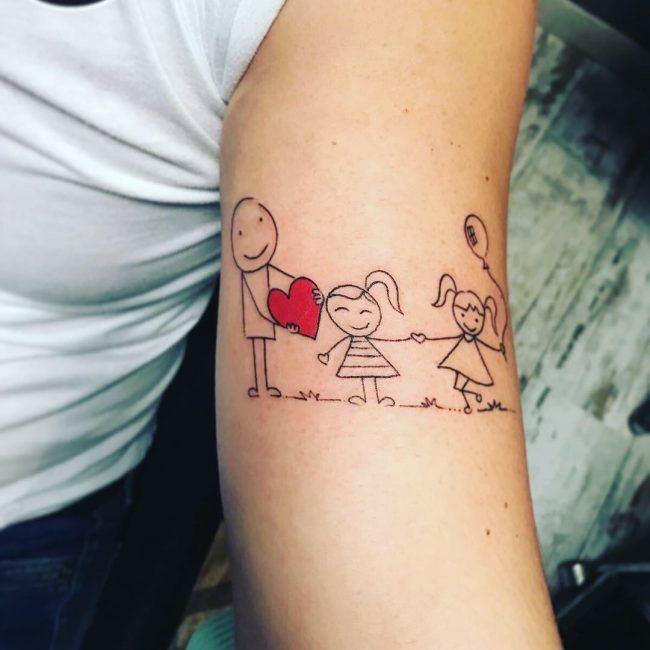 For this tattoo design, women tend to go with visually appealing designs because they want to fully express their love for their family through physical appeal. They will not mind the pain as long as the design is worth the family they believe they have. 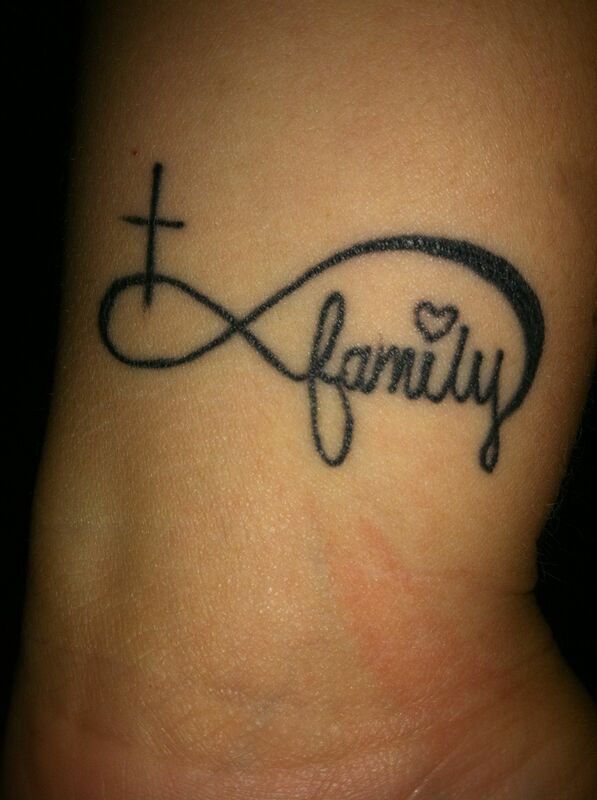 A tattoo of the word family as a part of the infinity symbol. 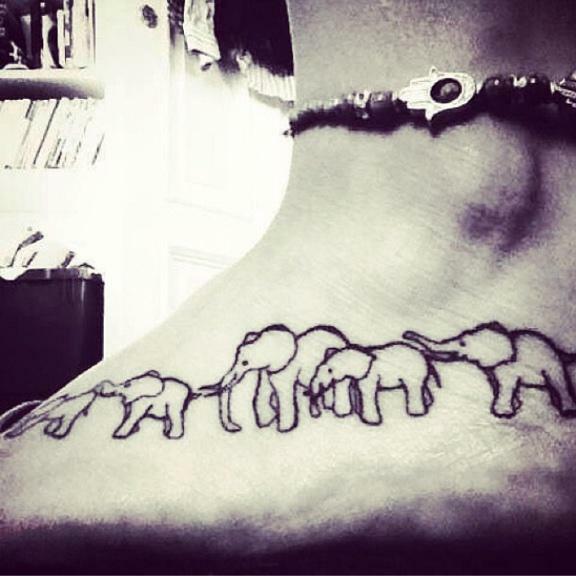 A neck tattoo of a family of elephants. 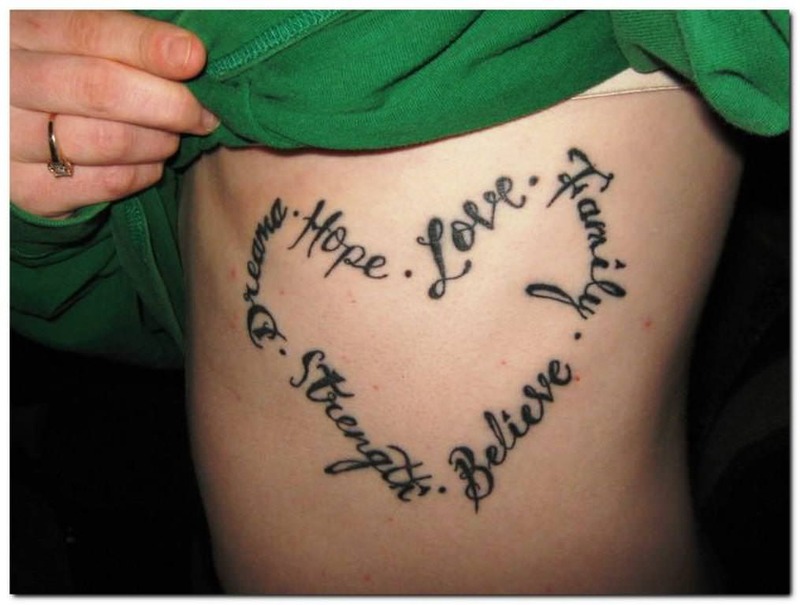 A rib cage tattoo of the words dream, hope, love, family, believe, and strength forming a heart. 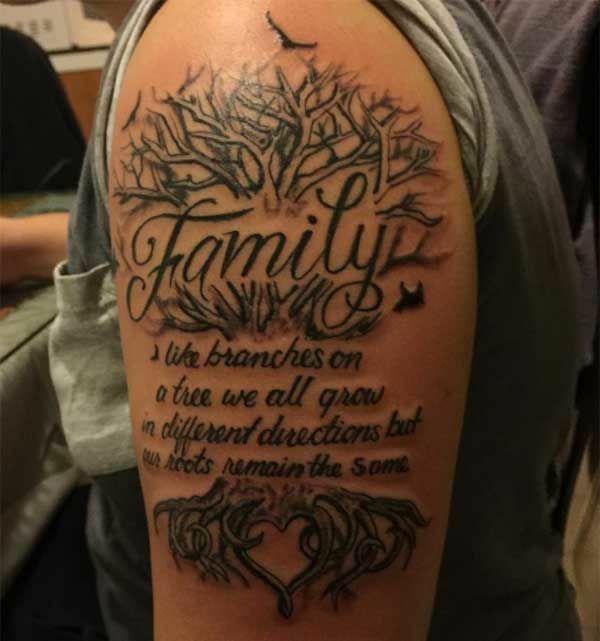 A large tattoo of a touching quote about family. 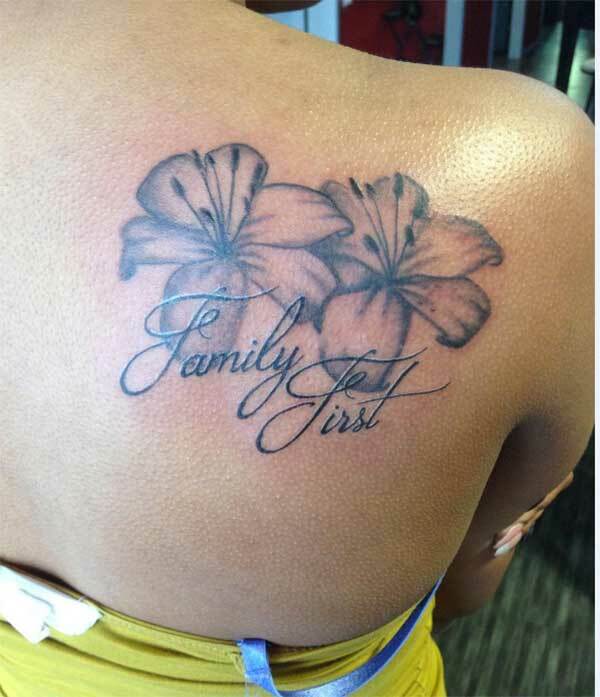 A shoulder tattoo of two flowers with the words “family first”. 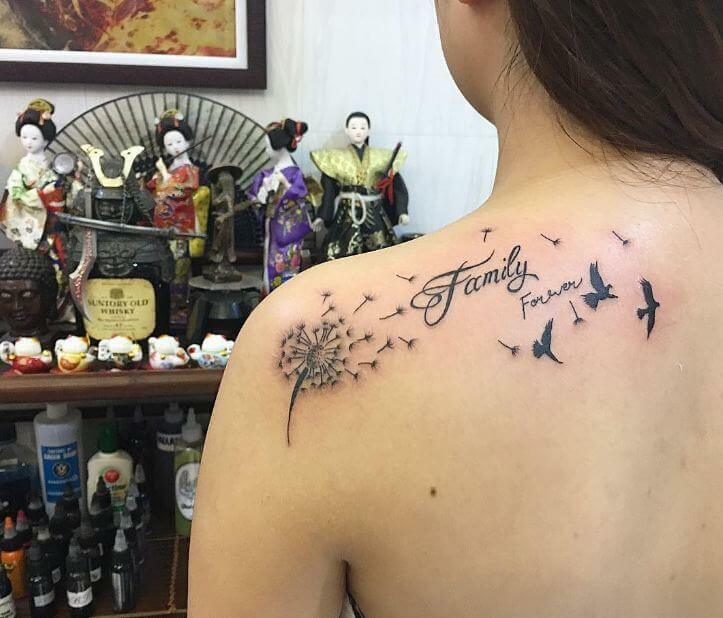 An artfully made family tattoo on the shoulders with a dandelion and birds. 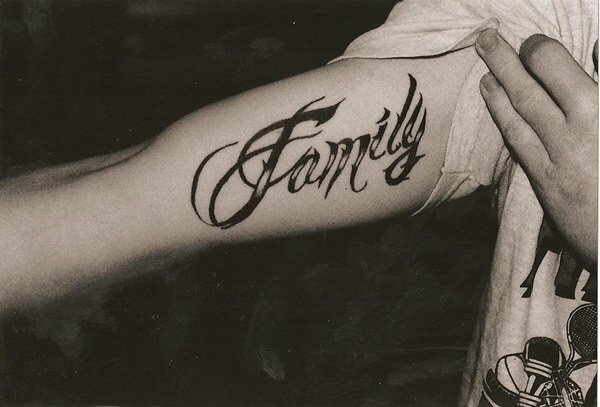 A large forearm tattoo of the word family in cursive. 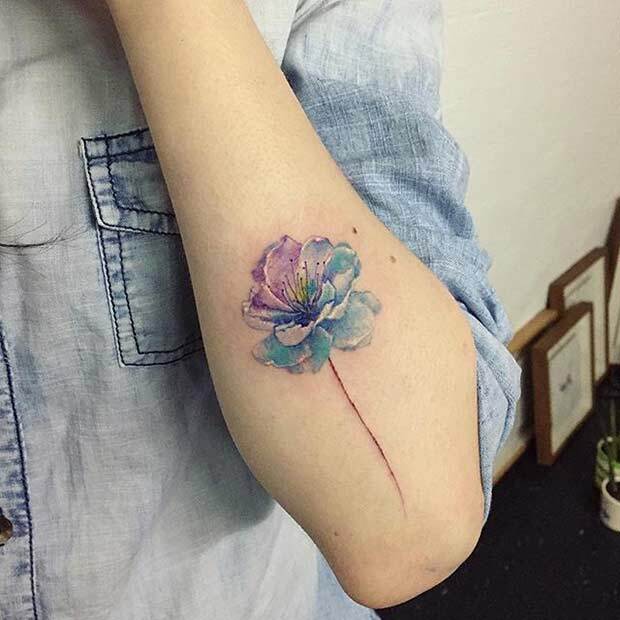 A forearm tattoo of a flower which may symbolize something in a family. A child like tattoo of a family drawing. 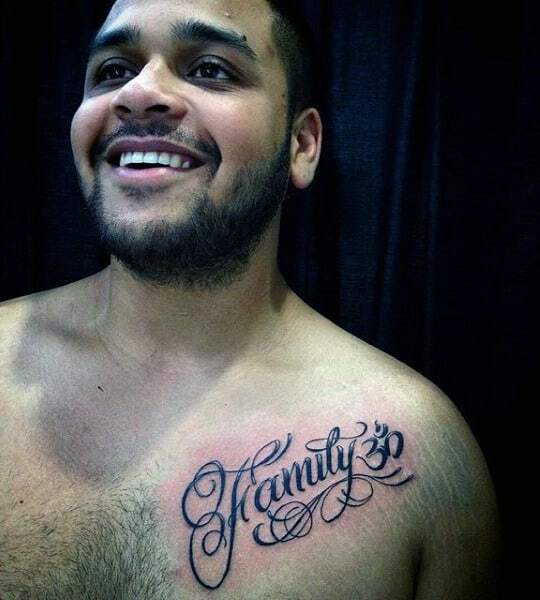 A tattoo of the word family forming the infinity symbol.